Dunc Munro (1901-58) was the captain of Canada’s gold-medal winning hockey team in the first Winter Olympics in 1924 in Chamonix, France. When he was young, Munro moved with his family to Toronto. He joined the Toronto Granites in 1920, a team that was largely composed of First World War veterans. They won the John Ross Robertson Cup and the Allan Cup in 1922 and 1923. Leading the Canadian team in the Olympics as a defenceman, Munro scored 16 goals in five games. 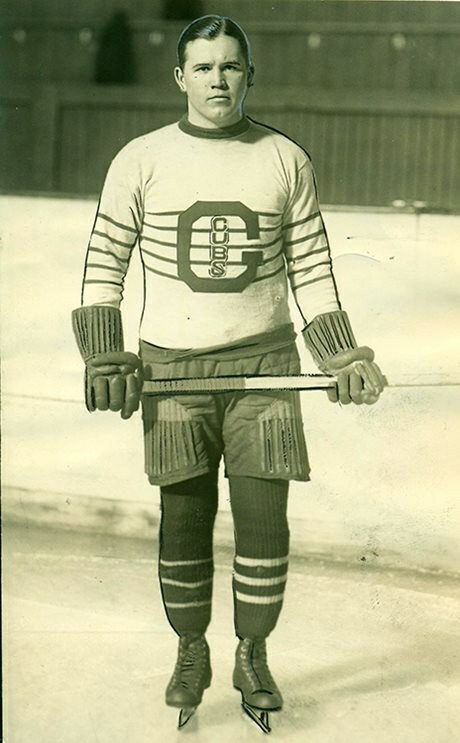 After the Olympics, he was signed as a free agent by the Montreal Maroons on October 30, 1924. The Maroons won the Stanley Cup in 1927. In the 1928-29 season, Munro suffered a major heart attack. He returned the following season as team coach and manager. In 1932, he signed with the Montreal Canadiens, but retired after only one season. Read more about Munro on the Greatest Hockey Legends blog. See a photograph of the 1924 gold-medal winning team on the Hockey Canada website.